A 10-story building in New York will be the first high rise there constructed with cross laminated timber. 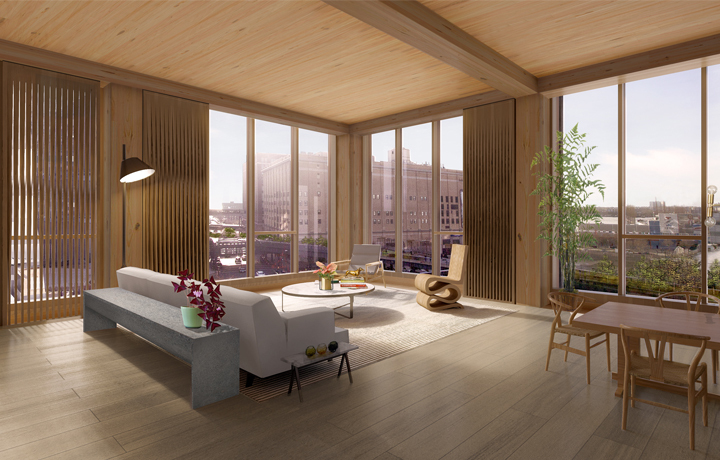 A 10-story timber tower is planned by SHoP Architects for Manhattan's Chelsea Neighborhood. If approved, it would be the first in New York City to use cross laminated timber construction (CLT). The building was one of two winners in a USDA competition to promote high rise wood construction. The 475 W. 18th St. 10-story building was one of two wood high rises that shared a $3 million prize. Located in Manhattan’s West Chelsea neighborhood, 475 West 18th Street is a ten-story residential condominium building designed immediately opposite the High Line. The building will contain fifteen two-, three-, and four-bedroom apartments. Skidmore Owings & Merrill has re-rendered an existing 42-story building using cross lamianted timber construction. The design is practical. 130-134 Holdings LLC, in partnership with Spiritos Properties, SHoP Architects, Arup, and Atelier Ten, proposed 475 West 18th Street as a model for the industry, demonstrating an innovative approach to construction by going beyond the typical, limited palette of materials and systems available for high-rise construction. The building will be the first in New York City to use modern mass wood systems, and will be the tallest building in the city to use structural timber, pending approvals from the New York City Department of Buildings.